“Robert Craft, an orchestral conductor, scholar and writer who was called an elegant Boswell by his supporters and a calculating Svengali by his detractors for his long professional association with Igor Stravinsky, spent nearly a quarter-century as Stravinsky’s amanuensis, rehearsal conductor, musical adviser, globe-trotting traveling companion and surrogate son. After Stravinsky’s death in 1971, at 88, he was a writer, lecturer, conductor, public intellectual and keeper of the Stravinskian flame. He was the author of many books about Stravinsky and as a conductor, Mr. Craft led some of the world’s foremost orchestras, among them the New York Philharmonic, the Chicago Symphony, the Philadelphia Orchestra and the Royal Philharmonic of London. He conducted the United States premieres of Stravinsky’s choral piece THRENI in 1959 and Alban Berg’s opera LULU in 1963, and the world premiere of Edgard Varèse’s vocal work ‘Nocturnal’ in 1961. Mr. Craft’s recording of the complete works of Anton Webern remains widely admired. Reviews of Mr. Craft’s conducting were divided, however. While some critics praised his impeccable fidelity to composers’ scores as brilliant, others condemned the resulting interpretations as stiff and bloodless. But he was almost uniformly lauded for his profound knowledge of music and his vast general erudition. His published essays, many of which originated in THE NEW YORK REVIEW OF BOOKS, encompassed music, art, dance, film and television. He was also commended for his work as a vigorous champion not only of 20th-century compositions but also of little-known early music. Writing in THE NEW YORK TIMES in 1999, the composer David Schiff said that Mr. Craft, ‘along with Leonard Bernstein and John Cage, has been one of the main shapers of American musical taste in the second half of the 20th century’. Mr. Craft was admired by many in the classical music world for giving renewed artistic vigor to Stravinsky - who was long esteemed as one of the world’s foremost composers, but whose powers appeared to be waning when the two men joined forces in 1948. He was directly responsible for introducing Stravinsky, a staunch neoclassicist, to the art of 12-tone music, an avant-garde compositional technique whose best-known avatar was Arnold Schönberg. The technique, also known as serialism, entails using all 12 notes of the Western chromatic scale in rigidly equal proportion throughout a composition. Many of Stravinsky’s celebrated later compositions are written in this style. Among them are the ballet AGON (1957) and ABRAHAM AND ISAAC (1964), a sacred work for baritone and chamber orchestra, both given their world premieres by Mr. Craft. But his collaboration with Stravinsky could engender public discord. Toward the end of Stravinsky’s life, when the composer had become too infirm, or too uninterested, to produce much work, Mr. Craft, his critics charged, was regularly serving as his literary, and even musical, puppeteer. The two men met for the first time in 1948, and before long Mr. Craft had moved into Stravinsky’s Los Angeles home. By all accounts beloved by the composer and his second, wife, Vera, Mr. Craft remained a member of the household for the next 23 years. Much of Mr. Craft’s writing about Stravinsky was well received. Discussing his book STRAVINSKY: CHRONICLE OF A FRIENDSHIP, 1948-1971 in THE NEW REPUBLIC in 1972, the composer Ned Rorem called him ‘the most readable and intelligent living writer on music’. But over time, accusations began to percolate that several books attributed jointly to Mr. Craft and Stravinsky, and billed as dialogues between them, were more Craft than Stravinsky. Some detractors also asserted that Mr. Craft, who was not a trained historian, had let factual errors creep into his biographical writings about the composer. In 1972, a front-page article in THE NEW YORK TIMES reported on allegations in a forthcoming memoir by Lillian Libman, a former personal assistant to Stravinsky. In her book, AND MUSIC AT THE CLOSE, published later that year, Ms. Libman contended that Mr. Craft was responsible for at least some of the lines attributed to Stravinsky in their published dialogues. (Stravinsky, whose first language was Russian, had uncertain English; Mr. Craft had no Russian.) She also maintained that two recordings billed as conducted or ‘supervised’ by Stravinsky had actually been conducted by Mr. Craft. In a related article in the same issue of THE TIMES, Mr. 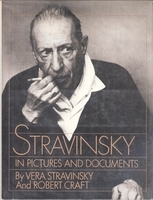 Craft said of Stravinsky: ‘He had opinions, and I took them down. Not the wording, of course. Stravinsky spoke and I put the words together. I don’t say they were his words’. He also acknowledged having conducted in Stravinsky’s stead on one recording.